This is a trivially simple addon that adds a keybinding for logging out to the character select screen. This allows for 1-button logouts, with no confirmations or warnings to get in the way. It is very useful for certain tasks, such as triggering hireling mails on a large number of characters. This keybinding will appear under the "General" category of the "General" section. 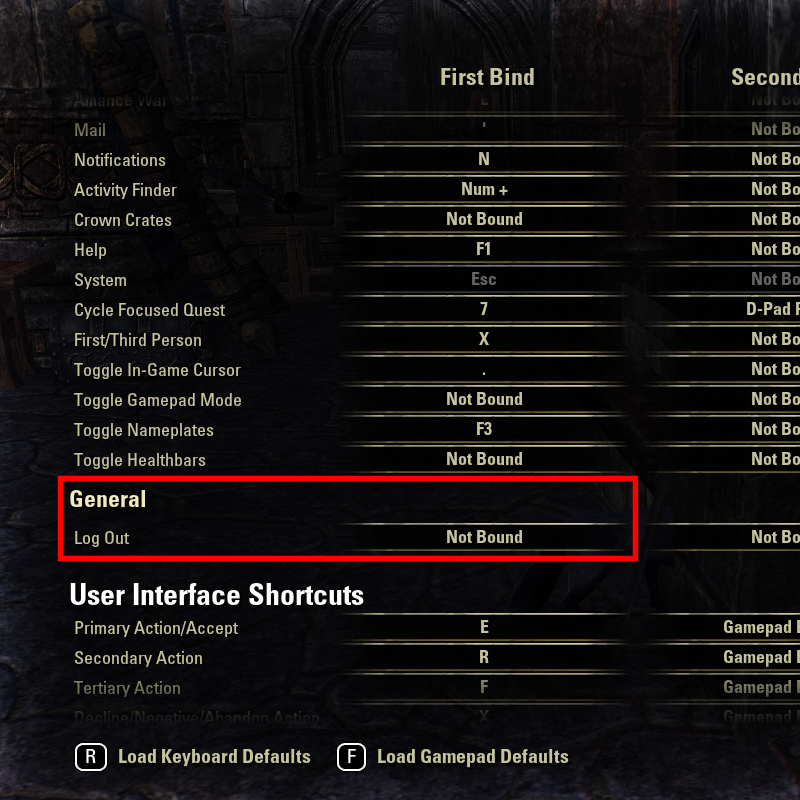 Changed keybinding category from "General > User Interface" to "General > General"
First, on the Addon Info tab, it seems to me that you need to clarify whether the keybind "logs out of the game" (ESC > Quit), or "logs out to character select" (ESC > Log Out). In any case, I've adjusted the description to make things a bit more explicit. Thank-you! FWIW, I have never logged-out to Character Select as a way to trigger Hireling e-mails on a large number of characters. Most often, I still log-out to Character Select and re-select the same character to trigger delivery of all pending e-mails, such as the return of an item for which I cancelled a Guild Store sale. Although, now the megaserver has been much faster at delivering those, so I just count-down five seconds and access the e-mail inbox. Doing that often enables me to retrieve the item(s). However, it seems to be affected by whether and/or how many e-mails in the inbox have been read, but not deleted. Last edited by code65536 : 03/22/19 at 08:13 AM. Thanks for this KISS Principle mod. Lean and not at all mean. 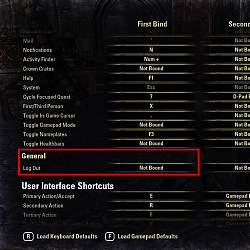 I use TOM, and even though I now know it has this logout keybind feature I still prefer that it be separate. I like this one because it's simple. I don't need extra features and even bigger performance impact from elaborately coded addons. I knew about TweakIt. But I wanted something standalone that did just that and nothing else. I didn't know about LogOut, though. Didn't find it when I looked. Might be because it was in the outdated category. Anyway, it doesn't really matter--an addon like this is so trivially simple anyway--it literally took just a few minutes to make. Last edited by code65536 : 08/17/16 at 11:20 AM.